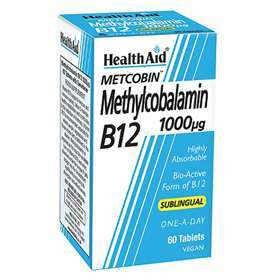 Metcobin Methylocabalamin B12 tablets contains vitamin B12 which supports nervous and immune system, helps to maintain healthy metabolism and contributes to the reduction of tiredness. Methylcobalamin is regarded as the most bio-available form of Vitamin B12 and when dissolved under the tongue it gets straight into the bloodstream significantly increasing its absorption and effectiveness. Free from yeast, gluten, wheat, soya, dairy, lactose, sugar, gelatine, salt, artificial colours, preservatives & flavourings. Children 3 to 12 years of age: One tablet daily with breakfast. Adults and children of age: one tablet daily with breakfast (can be increased to two tablet if required). Place the tablet under the tongue and let it dissolve. Do not exceed recommended daily intake unless advised by a suitably qualified person. Store in a cool dry place out of sight and reach of children. Sweetener (xylitol), Bulking Agent (Microcrystalline Cellulose), Bulking Agent (Microcrystalline Cellulose), Natural Blackcurrant Flavour, Vitamin B12 (Methylcobalamin), Anti-caking Agent (Veg. Stearic Acid, Veg. Magnesium Stearate).